BUJUMBURA April 11th (ABP) – The President of the Republic, Mr. Pierre Nkurunziza, received in audience on Tuesday April 10, 2018, the representative of the High Commission for Refugees (UNHCR), Mr. Fillipo Grandi, after his tour in the Great Lakes region, a check by ABP revealed. President Nkurunziza’s meeting with Mr. Grandi focused on the situation of refugees from the Great Lakes region. The two personalities discussed the situation of some 73,000 Congolese refugees living in Burundi. In that context, Mr. Filippo thanked President Nkurunziza and the Burundian people for the very generous welcome and hospitality they continue to give the Congolese refugees, despite the limited resources. Mindful of Burundi’s efforts, the representative of UNHCR appealed to the international community to make greater efforts to support the country and surrounding communities of the camps hosting those refugees to help them support this burden up to those refugees can return to their country of origin. 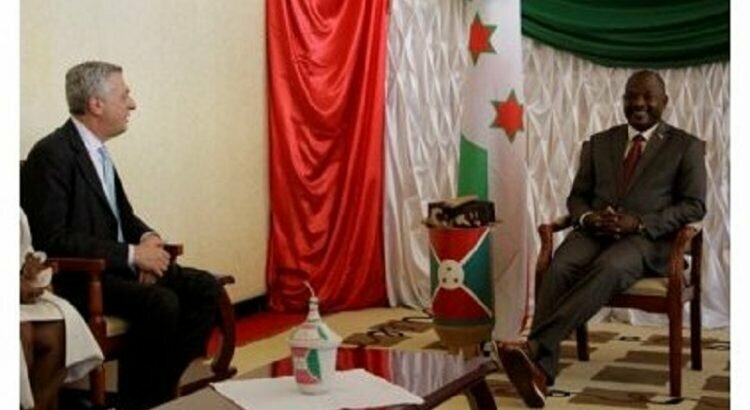 The issue of Burundian refugees in neighboring countries was raised during the interview. Mr. Grandi said that 21,000 Burundians have returned spontaneously and voluntarily from Tanzania from the end of 2017 until the beginning of 2018. He promised President Nkurunziza that UNHCR will continue to support the return of those who choose to return to the country and appreciated that President Nkurunziza is willing to continue this collaboration. The UNHCR representative is convinced that it is always important to resolve refugee problems through dialogue and discussion. It is in this context that he raised this issue the day before yesterday during his meeting with the Rwandan President and yesterday with President Nkurunziza, he said. Although collaboration with Rwanda on the refugee issue is still complicated, he promised to work for the establishment and facilitation of meeting and dialogue in a tripartite framework involving Burundi, the Rwanda and UNHCR. The aim is to examine all issues relating to Burundian refugees living in Rwanda. Another point raised during the hearing is the controversy over the number of Burundians still in refugee situations in neighboring countries. Although Mr. Grandi refused to admit that this is false numbers, he promised that those figures will be verified. Biometric registration, the safest, has already begun in countries hosting Burundian refugees. “My tour is also part of accelerating this process which is very important,” he said. He refuted allegations that UNHCR would prevent refugees from voluntarily returning home. “How can UNHCR prevent people who want to return home? He wondered, admitting that his organization is against forced return because, he explained, this is against the practice and principles of UNHCR.